Lance & Karin Boyer married in 1987 and stayed in their first vacation rental home during their honeymoon at Myrtle Beach. After their three children came along, they would often take extended family vacations to Disney World with Grammy & Grandpop. When they discovered Disney World was building the town of Celebration, they left their careers and became one of the first residents of this new town. As they led the team that created the Montessori School in Celebration, a friend on the team encouraged them to begin a vacation rental home company. On 17 May 1998, with an initial investment of only $250, they purchased two small internet ads and within one year Florida Dream Homes soared to over a million dollars per year in vacation rentals. It was the best investment they ever made! Today, Lance & Karin are at the Florida Dream Homes office every day working with the Team, inspecting homes, helping our guests have the vacation experience of a lifetime and protecting and enhancing the assets of our homeowners. Their three children are now adults and also assist with the business. Brandon, the eldest, does most of the photography and was the driving force behind our new branding strategy. Colin is a professional illustrator who helps with photography and was instrumental in our website design. Amber, the youngest, fulfills the role of Assistant Office Manager when she is home from Virginia where she got her degree from Sweet Briar College. 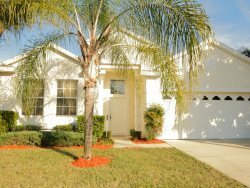 Florida Dream Homes is now one of the oldest established and most trusted vacation rental home property management companies right beside Disney World. We have grown into that unique American combination of a Family Business with state-of-the-art technology and advertising that is able to provide professional services with a personal touch.